Wilson Creek Parkway, no markers. The Black Cemetery in McKinney was located southwest of and across the old Dallas Road from the present-day Bradley Cemetery in southern McKinney. It was considered part of the Bradley Cemetery. It was the only known cemetery for blacks in McKinney for forty years. No one knows how many graves it contains. The graves were marked with bois d’arc markers. It was probably started in the 1850s, about the same time that the Bradley Cemetery was started and was not used after the 1890s when the Ross Colored Cemetery was opened about two miles to the east. Both the Bradley and the Black Cemetery were totally neglected for many years. At one time the land around both cemeteries was owned by E. W. Kirkpatrick, a noted horticulturalist. He planted many of his experimental trees near the cemeteries. There are newspaper articles that refer to the Bradley Cemetery being in Mrs. Waide’s pasture (Mrs. Waide was his daughter). It is said that there was a wire fence around the Black Cemetery and indeed, a bois d’arc fence post has been found in place. The cows roamed in the Bradley Cemetery. 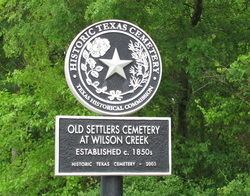 When the City of McKinney planned to build Wilson Creek Parkway, several people told the city about the Black Cemetery. Officials from the NAACP and the city looked into the matter. It was agreed that the Black Cemetery did exist but that it was not possible to determine its location and boundaries. A Texas State Historical Marker was obtained for the Bradley Cemetery at that time (1986), which mentioned the Black Cemetery as being nearby. When Wilson Creek Parkway was under construction, a couple of the remaining bois d’arc markers from the Black Cemetery were taken to the Collin County Museum at the Old Post Office for safe keeping. In1999 when the City of McKinney planned construction on the south side of Wilson Creek Parkway, the issue of the Black Cemetery came up again. The city hired Geo-Marine, Inc. of Plano to locate the cemetery. Using information from a descendant of E. W. Kirkpatrick, an area was designated for study. Top soil was scraped in seven trenches in the designated area. Five graves were located with a few other possible graves. The greatest number of graves were located near the Parkway. The city of McKinney plans to fence off the cemetery, enclosing with it some of Gen. Kirkpatrick’s non-native trees. The area to be fenced is approximately 120' x 195' x 135'. When a Texas historical marker was applied for, the state historical commission said there wasn't enough proof that it was a black cemetery, so they named it Old Settlers Cemetery. Bradley family descendents said it was a black cemetery, but they were deceased by the time the Texas Historical Commission approved the marker.